Revoice Pro Sessions contain, display and retain all the audio and process control settings. The session name is shown at the top of the Revoice Pro Window. The name remains "Untitled" until the session is saved with a name. Sessions are saved with a .rvp extension. Multiple sessions can be open simultaneously, and you can open multiple windows on the same Session if needed. Like other audio editing systems, you can save and load Revoice Pro Sessions using the “File” menu shown below for Mac (left) and Windows (right) or the Quick Key Shortcuts following each command. Open and Open Recent – Opens previously saved Sessions. Save As Default Session ... Saves the track layout, names and settings of the current Session (including audio, if any) to be opened when next select "New". 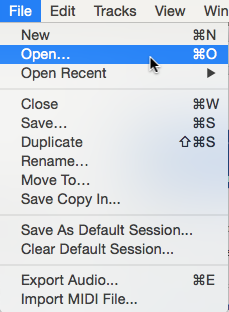 Auto Save can be turned on in the Preferences, to save sessions periodically. These menu options will vary slightly depending on the version of OS that you are using. If you save a session that has temporary audio files associated with it, such as those generated by plug-ins using Revoice Pro, you will be asked for a location to save the associated audio. If you have loaded audio manually into Revoice Pro, it knows where this is located and so will not ask you for a location to save it.